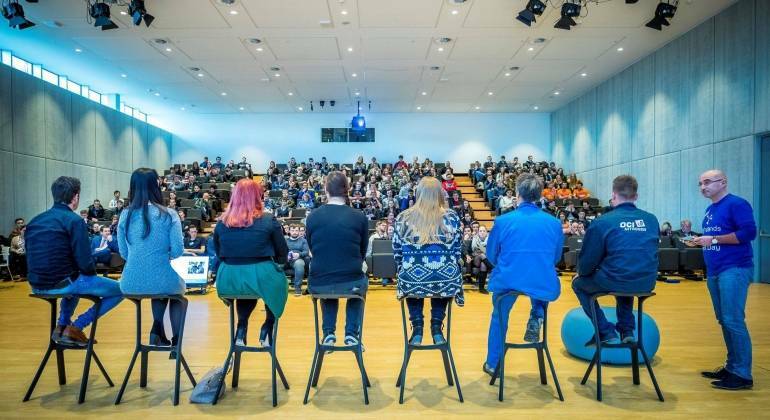 This encouraging news was just one of the messages communicated this past Friday to over 500 students from the Netherlands, Belgium, Germany and the United Kingdom during the second Brightlands Chemelot Talent Day in Sittard-Geleen. With over 500 people registering for the event, the interest in this second Talent Day was nearly double that seen for the first edition in 2017. In his opening speech, Provincial Deputy Joost van den Akker (Economy and Infrastructure) emphasized the opportunities in chemistry, materials and biotechnology that Limburg has to offer young people. Students from universities and institutions of higher education attended the event to gather information on the study and career opportunities at the Brightlands campus and the companies based at Chemelot. Attention was also placed on the attractive climate for living, working and studying in Limburg. Professionals and HR employees from the 30 participating organizations showed the attendees why the Brightlands Chemelot Campus and Chemelot Industrial Park actually form a single unique location. They focused on the intensive cooperation between scientists, entrepreneurs and students at the 140 companies with premises at the Brightlands campus and “neighbor” Chemelot. In addition, the campus also offers bachelor’s and master’s degree programs from Zuyd University of Applied Sciences and Maastricht University. To get an impression of the 2018 edition of the Brightlands Chemelot Talent Day, please visit www.brightlandschemelottalentday.com. factories located at Chemelot Industrial Park produce chemical products on a large scale. The site is evolving to become the most competitive and sustainable chemistry location in Northwest Europe.